Days after an image of the LG G6 leaked, a new photo of another upcoming Android flagship has surfaced. 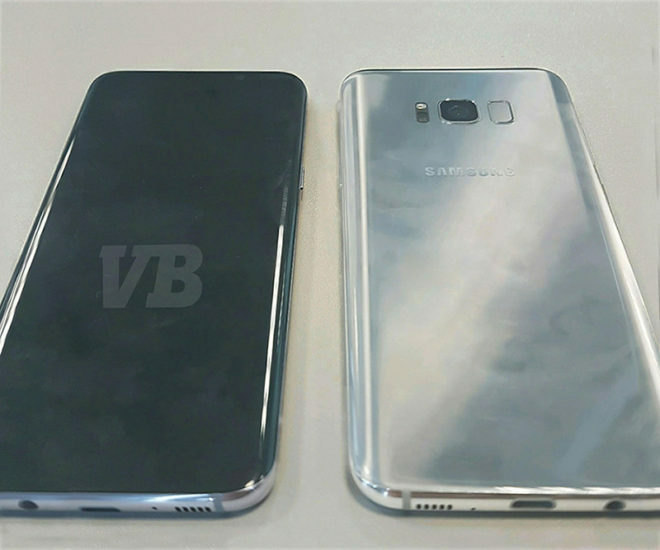 A new photo claims to show off both the front and back of the Samsung Galaxy S8. Specifically, this is the larger of the two models, says VentureBeat. This GS8 is said to include a 6.2-inch Quad HD Super AMOLED display with an aspect ratio of 18.5:9 and curved edges, as well as a 3500mAh battery. The smaller Galaxy S8 will reportedly include a 5.8-inch Quad HD Super AMOLED display with the same aspect ratio and curved edges as the larger model. The battery of this version will be smaller, though, measuring in at 3000mAh battery. The displays on both phones will allegedly include a touch-sensitive portion on the lower part of the display that’ll distinguish between different screen presses, similar to Apple’s 3D Touch functionality. Both phones are expected to include a 12-megapixel rear camera with a visual search feature, an 8-megapixel front camera, and an iris scanner. Because Samsung opted not to use a physical home button on the GS8, the fingerprint reader has moved to the back of the phone, next to the rear camera. Samsung will also include Bixby, its new virtual assistant that can be activated by pressing the dedicated button on the side of the phone. Bixby is said to be more advanced than some of the other digital assistants on the market, with the ability to handle multi-step instructions. Another rumored feature of the GS8 is the Samsung DeX. With this feature, you’ll be able to plug the Galaxy S8 into an HDMI dock and connect it to a monitor, keyboard, and mouse to get a desktop version of Android. Rounding out the Galaxy S8’s rumored feature set is 4GB of RAM, 64GB of storage, a microSD Slot, USB Type-C, stereo speakers, and a 3.5mm headphone jack. Samsung is reportedly planning to include a Snapdragon 835 processor in some models of the phone and an Exynos chipset in others. Samsung is going to unveil the Galaxy S8 on March 29, says today’s report. There’s no word on when the GS8 might launch in the US, but a European launch is allegedly happening on April 21, with pricing set at €799 ($854 USD) for the 5.8-inch model and €899 ($962 USD) for the larger 6.2-inch version. According to today’s report, Samsung has quite a few changes in store for the Galaxy S8. Some of those will likely be welcomed, like the inclusion of USB Type-C, but others might frustrate some folks, like the lack of a flat screen model. We’ll just have to wait until Samsung officially launches the GS8 before we know exactly how they handle and perform. What do you think of the Galaxy S8 based on today’s leak? Are you looking forward to Samsung’s next big thing? They should have taken the pictures before the fingerprints got all over the phone. If these are legit, I don’t like the FP reader placement at all. Yeah, looks like they’re using the same location as the heart rate sensor on the Galaxy S6. Guess that’s Samsung’s way of making their phones different from the competition. ex. Google Pixel, Nexus 5x/6P, Huawei Honor 8, etc. all have their fingerprint scanner in the back center. You have to be joking! With this bigger phones I guess the note is officially dead! The only thing that was left out was the stylus. Also that placement for the fingerprint represents like they do no surveys or get any feedback, other manufacturers use the round a middle sección because it feel natural, that placement is uncomfortable,i never used the 02 or heart rate on my galaxy phones because of it. The specs do nor surprise anyone, I would have expected at least 128 in storage and some extra ram just to make up for their note fiasco and their memory management which is a joke. Is it just me or does that look like a micro USB port instead of a Type C? Yes it most definitely does, and it kind of looks photshopped on there. It’s the one spot I thought, hmmmm… is this a real pic? I think Sammy f**ked up with the finger print sensor being place in the back, right next to the camera lens. What in the world were they thinking?? Looks like a very awkward place to put it, considering most people don’t touch that area with their fingers. Samsung went 2 steps forward and took 10 steps back. Also the phone on the right seems to have the standard mini USB port and not USB Type-C. Maybe it’s just the roundness of the edges, but darn, Sammy sure messed up. Apple is certainly going to retake the lead as they have imbedded the finger print sensors right underneath the screen. COME ON SAMSUNG!!!! RAISE YOUR INNOVATION GAME UP!!!! You’ve become BASIC!!! They are all ‘basic’. Close to $1000 and no removable battery?!? So, you’ll be buying another in 2 years. The only manufacturer that tries anything different is LG & they get crucified for it. If they could fix those bootloop issues, I’d buy one in a hearbeat. Seriously considering my next phone to be an Apple. At least they have good resale value. A removable battery is a sign of cheapness. Your $10 basic Tracfone has a removable battery. Sad. So a Note4 is a cheap phone? By this logic, you would buy cars with non replaceable oil filters if makers just made the cars look more premium. So, I guess sheeple don’t mind spending $1000 on a phone every other year. Then, they wonder why they can’t pay off student loans or get ahead. It’s sad, how disposable phones have become the norm. I’m still on my S4 for this very reason. Well with the Galaxy S6 the heart rate sensor was placed where the fingerprint reader is located in the S8 photo. Therefore I can see why Samsung would place it there instead of the center like other phones. Perhaps they didn’t want their phones looking like the competition. You sound like a basic clown at best. And how exactly does he “sound like a basic clown”? What do you think is wrong with what he said? Do/are you ever going to do anything other than just spew your childish opinions and leave without backing up your side of the story? And wtf exactly is a “basic clown”? Is it different from a “complicated clown”? Is it different from an acidic clown? Late prototype definitely not finished product so things will still change. Like 6gb of ram in both and the fingerprint sensor will be in the glass not the back. Bwhahaha! Proof you have no clue what you’re talking about. All other rumors have stated the fingerprint sensor will be on the back. All rumors have stated 4 GB of RAM. And we’re supposed to believe you? Based on what? Your incredible track record of getting predicted specs wrong? Hahahahaha! Keep it up! That s6edge guy is hilarious. Is the fingerprint scanner gonna be as scratch prone as the S7 ones? I hated that about it. Did I read correctly there will not be a physical home push button anymore? Its on screen now? What a hugh setback! I think you misspelled “improvement.” The physical home button is a nuisance. Top of the line is top of the line Samsung deserves the cash for these handsets they easily will be the best android handsets on the Android platform till the Note8 and NoteFold in September. Samsung doesn’t deserve anyone’s money. Both Apple and Samsung need to die. Hopefully sales continue to suffer after the Note 7 fiasco. Generally when consumers associate the words fire and explode with a brand, they tend to be leery and with price tags like that, consumers are already leery. You can buy a 55in 4K HDR TV and an Xbox One S for the rumored pricing of the 6.2in model! I think I’m going to stop with the madness and see what ZTE and OnePlus do once the 835 gets into their devices… I have an HTC 10 right now and I’m pretty happy with it but the Axon 7 and OnePlus 3T are much more attractive than the Samsung… And that’s not even factoring in their draconian encrypted bootloaders which turn me off even more. I can only laugh at you useless bargain basement low budget handset buyers you guys are bain of technology. Samsung sold 90 million smartphones in 2016 the so called Note7 fiasco HAD NO EFFECT on Samsung’s revenue nor has it deter any current customers or future customers from the brand stop making a fool out of yourself. You’re HTC 10 is a pathetic joke on the Android platform and so is worthless HTC they’re going nowhere as usual. Step to the left my friend budget buyers buck saving Android users don’t know quality if it slapped them in the head. It’s always been pretty much plain and simple for me since March 2011. Nothing beats Samsung they are Android and technology nothing else matters period. 1. They haven’t even released the data fro Q4 2016, so on that point alone, you’re wrong because you don’t know. 2. Between all their smartphones (the cheap ones and the expensive ones), I guarantee you Samsung sold way more than “90 million smartphones”. And you call yourself a fanboy? What a joke! “the so called Note7 fiasco HAD NO EFFECT on Samsung’s revenue” Wow. You don’t jack squat, or choose to ignore certain facts. Go ahead and google search “note 7 revenue loss” and tell me Samsung didn’t loose revenue. I’ll wait. Know your roots man. HTC is the reason Android took off in the first place. It’s hard for HTC and anyone else to compete with Samsung and Apple when those two companies have everything from deep pockets to carriers in their back pockets as well. When the M8 came out, my store didn’t even put them on display. I asked them to get me one from the back, they tried to shove Samsung crap down my throat even though I was upgrading from the M7 so obviously liked the One design. The M9 was a bust and I had a Nexus 6 and a Note 5 during that time but then I jumped on the HTC 10. Here’s what I can say – HTC has made some mistakes over the years but from the days of Windows Mobile 5 to Android kicking off, they were a force to be reckoned with. Oh and my HTC 10 survived a drop from the balcony onto the tile on the first floor with just an 8 dollar TPU bumper case on it and my M7 fell from my ear while I was talking on it and rolled on its sides before coming to rest on its back because of how HTC had weighted the design – unless dropped face first, it hardly ever would actually land on its face. Don’t know why I’m getting into it with a fanboy but facts are facts. HTC makes great phones, Samsung just outshines them from advertising to carrier agreements because of their deep pockets. The truth is that Samsung has more defective products than anyone else. Budget bargain basement handset buyers would feel you’re way Samsung users are buying regardless what you think. At the end of the day Samsung is technology and Android period everything else is pretty much worthless and comically boring and obsolete. True….fanboys will buy (and defend) in spite of the price and and recent exploding phone debacle. But any logical consumer will compare specification vs the competition and previous models in order to determine the value for price. If my current top of the line phone is still working and no truly revolutionary changes have been added to the new model than why should i upgrade, just to keep up with the jones’s? Impulse buying like that is a common trait of broke and in debt people. And to be honest Samsung would lose a few points in my value book because i have to wonder was the Note 7 just the start of a bad Quality controls or a one off. Huh. Look at that. The Samsung fanboy spouting off the same regurgitated crap he’s been spewing for the past 6 years, with no further/more detailed explanation as to how or why. What a surprise. Is Samsung really “top of the line” though? What exactly constitutes “top of the line”? Sure, their phones have tons of features… that basically no one uses. The size of these phones are ridicules. Keep in mind that we haven’t seen the size of the bezel on the phone. Without the physical home button, the bezel on the bottom of the phone would be a lot smaller, therefore even if the smaller sized S8 has a screen size of 5.8in, the overall size of the phone can still be the same as the current Galaxy S7 with the larger top and bottom bezel. Same goes for the larger 6.2in S8. That means you’re not buying so simply step to the left. Explain that, if you even can. I’d love to hear how you get “I’m not buying it” from “that’s ridiculous”. How do you know that? We only have the screen diagonal right? The ratio is now 18.5:9 so that just means a longer screen with therefor a longer diagonal. It doesn’t translate into a wider phone necessarily. Or even a longer phone since there’s no home button. Bit only the screen is longer. The phone itself isn’t. I am not so sure on this. There was a number of rumorrs pointing to the S8 removing the headphone jack and now it is back. Also why would Samsung go from there normal S7 with a 5.1in screen to having the normal one being 5.8in. That makes no sense to me at all. There would be close to no reason to own a Note next fall if one comes out. Also 6.2in for the biggest one. That is crazy big. I can not see that happening as well. Consider this. We haven’t seen the size of the bezel on the phone. The picture shown in the article does not clearly show the bezel/frame of the front. Without the physical home button, the bezel on the bottom of the phone would be a lot smaller, therefore even if the smaller sized S8 has a screen size of 5.8in, the overall size of the phone can still be the same as the current Galaxy S7 with the larger top and bottom bezel. Same goes for the larger 6.2in S8. Exactly nobody does it better than Samsung when it comes to producing products in small footprints. Not dorky looking like the useless iPhone 6Plus or iPhone 7plus as well as the worthless Nexus 6p and silly Pixel handsets. And yet, we’re talking about their largest phone to date. I don’t think you have any idea what you’re talking about. They were able to increase screen size without increasing physical dimensions by eliminating physical home button, and bezel. I guess when you put it that way it could be just seems like a big jump, I feel like that big of a screen may put some ppl off u the size is the same over all. That 5.8 is in a different screen ratio. so the .8 is simply the extra length, not width. And with no buttons, the phone is not going to get bigger. You just get more screen in the same or close to the same phone size. Monitors, as an example used to come in 4:3 ratio. A 19″ 4:3 monitor was really big for average desktop use. Then they went to 16:10 and 16:9 and all of a sudden a 19″ monitor is tiny. This is because the diagonal is stretched over a longer width, so the height becomes a joke. And in modern monitors a 25″ 16:10 is usually plenty of monitor, but if you want a similar feel in the height of the monitor in a 16:9 you need 27″. Same with TV’s. A 32″ 4:3 CRT was absolutely HUGE. While a 32″ 16:9 is not so much. so those phone screen sizes make sense given that the ratio on these is said to be 18.5:9 instead of 16:9. I suspect the extra bit will simply be samsung’s area for their version of the android soft buttons for home, back, menu, tasks, or whatever it is. Definitely purchasing the S8Plus and GearS3 Frontier day one of launch then will proceed to the Note8 in September. Me too, i can’t get rid of this lg v20 quick enough. I never owned a Samsung, but I’ll get one for the first time if they ditch the home button. I LOVE the home button, and I LOVE the fingerprint being on the front. I often unlock my phone in the dock or on a table with my index without picking it up. So I’m going to hesitate on this one. I’ll have to think hard on it if they really move the fingerprint reader to the back. I always use a sturdy case, so case availability and designs will now impact my decision more than usual as the case has the potential to really mess with the reader. If I have to grab the phone and press the power button to wake it up, I will consider that a step backwards in convenience. I totally agree! Moving the fingerprint sensor to the back is a heartbreaking deal breaker for me. I rely on bring able to easily turn it on and unlock it with a discreet touch while it’s laying on the conference room table on in the mount in my car. My impression of this pic is that it’s fake. First, that’s a microsd slot on there, not USB C. Second it looks like it’s out of proportion and out of alignment. It also looks like it’s pasted on there after the fact in photoshop. Also, the fingerprint button on the back is EXACTLY the shape of the current home button, which it would be if you were cutting it from the front, rotating it sideways and pasting it on the back. Bluetooth 5.0 & QuickCharge 4.0 are yet to be confirmed. New year, new phone…I expect NEW standards! Samsung failed to included QuickCharge 3.0 in the S7. . .fast charging happens to be a feature that I greatly value. I like the size of my Samsung Galaxy S7. The smallest S8 according to the article is 5.8 inch screen i think. Only 64gb for internal storage. The Samsung Galaxy S7 Edge was released in China this week with a new black color with 128gb of internal storage and supports sd-card. I would rather that phone than the S8. I hope this isn’t official.. I actually like the home button. It is consistent with what has been being leaked on this phone for over a month. I like the large screen idea. Just not the edge design. Agree. I would prefer a more durable phone with .18″ less screen size to stretching the screen around to the sides. I’m already uneasy handling a new phone I don’t want a sleek phone that requires an extra thick case to protect it, self defeating. If they try selling this thing in the United States for $854 & $962 they are not going to sell very many of them. I’m all for innovation when it represents improvements but that thing looks like it’s one short drop from becoming a disaster. That fingerprint scanners is in an absolutely mindless location. Smaller battery than the S7 Edge but more screen, no thanks. The S7 Edge is a damn good phone. Samsung is going to need to really put thought and creativity into any new device rather than just rearranging the buttons, decreasing the battery, increasing the screen size, changing the 7 to an 8 and trying to sell them. I’m not considering the S8? In fact I purchased my S7 Edge within the past 20 days. I considered waiting to see the S8 but knew the S7 was a good phone and would be taking a risk with a new model. I upgraded from a S5, before that was an S3, before that was the Nexus One, LOL. And it was a damn good phone too, I love that little phone but it obviously too dated. “€799 ($854 USD) for the 5.8-inch model and €899 ($962 USD) for the larger 6.2-inch version.” except that you can’t just convert euros to usd to get the price. That pricing is for the european/international model and will be slightly more expensive than the USA model. The USA model is probably going to be $700 – $800 for the smaller version and $800 – $900 for the larger version. $800 for a phone? No thanks, I’d rather have a happy retirement than piss away that much for minor upgrades that will be outdated within 2 years. Consumerism at it’s worst. Consumerism is saying it’s outdated in two years. Get over yourself. 2 year old phones are more than decent to have. No, consumerism is saying that it’s worth $800 when you could just as easily get last years model for less than half of that. There’s absolutely nothing wrong with having a 2 year old phone, but if you wait 11 months for your purchase, you’ll literally save hundreds of dollars. If you’re on a jump plan to always have the latest and greatest, that’s consumerism to the max. Constantly leasing a phone for routinely minor improvements is a total waste. I honestly don’t care how people spend their money, but the difference in cost for what you’re getting is not a great return.